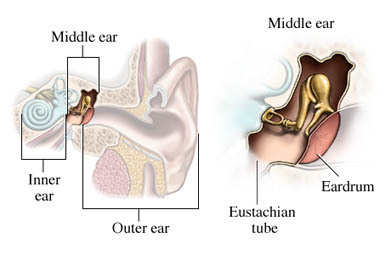 Tympanoplasty is a surgery done to repair the eardrum and middle ear bones. The eardrum and bones are necessary to hear. Before surgery, your doctor will check to be sure that you do not have an ear infection. You will have several tests, including an ear exam and a hearing test. In certain cases, a CT scan is also done. General anesthesia is used. You will be asleep through the procedure. A small incision will be made behind the ear. Some tissue will be extracted from this area. This tissue will then be attached to the eardrum to cover the hole. Other materials may be added to hold the graft in place. If the bones of the middle ear need to be repaired, then this is done as well. A small pack may be left in position in the ear canal. The incision behind the ear will be closed with stitches. You will need reduce activities, especially those that cause strain like lifting. You may need to avoid flying and exposing the ear to water. Follow your doctor's instructions on how to wash your hair once you are at home. Complete recovery takes about 4 weeks. Tympanoplasty. Northwest ENT Associates website. Available at: http://www.nwentassociates.org/Tympanoplasty.asp. Accessed July 23, 2013. Tympanoplasty. UW Health website. Available at: http://www.uwhealth.org/healthfacts/ear/4919.html. Updated January 24, 2013. Accessed July 23, 2013. Tympanoplasty/paper patch myringoplasty. Children's Hospital of Pittsburgh website. Available at: http://www.chp.edu/our-services/ent/patient-procedures/tympanoplasty. Accessed July 23, 2013. Tympanoplasty: Repair of ear drum perforations. Ear Institute of Chicago website. Available at: http://www.chicagoear.com/Ear%20Surgery/tympanoplasty.html. Accessed July 23, 2013.